Re: Virgin Burner - burning virgin? I just bought my ticket for the 2007 burning man event :D . I am soooo exicited!! i have downloaded the survival guide, i have some friends who are burners, so i have gotten some information from them as well. I am currently planning to come alone, but will try to find some fellow burners in my area as well. I am in sacramento area (northern CA) for those who dont know where folsom is. I welcome any additional advice, or if there are nor cal burners out there.. give me a shout out! [quote="BAS"][quote="DJ Dominus"]What up? I'm Jason Dominus from the Madtown of WI. I was at the BM Decompression party in Chicago with my partners in distributed aural satisfaction. We got a taste and it's on in 2k7. This will be our first BM. We will be at the Cactus Jam tent. I am psyched and I hope to meet a lot more cool cats like I did at the decomp. Have a good time there, okay?! Added you to my buddy list. Hope you get the job situation straightened out. I know how stressing that can be. If you end up being able to go or are gonna hit up any of the regional events, shoot me a PM. Okay, I'll try to remember to do so. I do have a friend in Sun Prairie who has been wanting to go, but couldn't make it last year. (I don't know if he could make it in 2007 or not.) I wound up going with some people from the Chicago area. I'm a 51 year old, mother of three. My oldest son died in 2005, my other two have grown up, and gotten on with whatever they managed to keep intact. For 2 years I have been sitting in my room, doing the grieving mother thing to the ninth degree. I've been to shrinks, group supports, and blogged my heart out. But here I still sit. So, now at 51, I find myself with end stage liver diease, (from Hep C), treatment resistance depression, all alone (I've been a single parent for the last 15 years), misanthropic, and terrified this is how I'm going to die. Alone, in the puddle of misery I've been wallering around in for far too long. It ain't pretty. Knowing that you can have the will to live, but not to die, leaves you to realize that this hopeless, sad, pointless life can go on forever and ever. That's when I found out about the Burning Man. No such thing as coincidences, so I felt this was something I had to do. To save myself. I've been sitting here in my room, waiting for someone to come take me by the hand and lead me out of the dark side into the light, but, no one ever comes. I've made it this far into the light on my own, but it's taken a lot, and, I sure could use some help and advice on what I should do next. Maybe this is one of those "too much info" errors, I was just trying to get out as much as briefly as possible. So....what words of wisdom do you have for me?????? I discovered Burning Man the year my oldest brother died (2001). There's a lot more, but the event was just what I needed. I just turned 50 last Friday, didn't manage to have kids, and have had a few health issues myself. C'mon Home and roll in the dust with us. Oh yeah, read the freakin' Survival Guide and First timers info, repeatedly. Not one of us controls our life, in spite of our self delusion. I urge you to do something to help someone else, volunteer or education about your experience, anything. Some times it helps to help someone worse off. Mostly it just helps to be helping someone. At worse, you do some good. And get ready for burning man too. You may want to visit the temple at burning man. "Everything is more wonderful when you do it with a car, don't you think?" It would be a shame if I had to resort to self-deception to preserve my faith in objective reality. Me again, thanks for the 'words of wisdom'. I don't want to feel out of place there, I can do that at the house. I have an RV, I'm not for tents & such, but, if I can load her up with all I need and then some, what would be the best things to bring. It is about other than just yourself, isn't it? I see the themes are broken into three groups. I fit into the first two, so I'm not sure. Should I just plan on being on the outskirst, is there a place where all of us RVwussies have to be parked? Is there anyone from the great northwest that head down to NV. I don't think I'm ready for a bunch of "life is great, ain't it good to be alive" happy happy joy joy folks, I have to ease myself into this people thing, but it would be great to have a convoy of sorts. Because I'm such a procrastinator, I need to start getting ready now. Any special tips for RVer's? The territory for theme camps and villages is marked, but that leaves a lot of open space. Just be sure you visit with the new neighbors before setting up. I think there was a happy happy joy joy camp last year. There are some groups of rvs, but you can park lots of places. Just arrange enough space somewhere. A lot of rvs come. Yes, please, please read the first-timers guide and the survival guide. The Playa is pretty harsh at times, and knowing essentials, is well... essential. Welcome!! Planning for burning man has totally changed my daily additude for the better and I hope it does the same for you. The more planning and information gathering you do the better you will fare in that beautifully harsh Black Rock Desert. Non reserved camping spots are a free for all with areas on the outside of blocks filling up first and then infill in the center of the block. If you drive down on sunday or monday you will be in a convoy with other burners. Put a Burning Man symbol on the back of the RV so others can honk and wave or stop if you need help. I really recommend getting there early in the week because there is a really good easy-going feel to the community at that point and you can get an on street spot. Allways carry a cup and have a good supply of water with you at all times. Bring a comfortable junker bike or two with wide tires and lights for night. Buy a pair of hand-cuffs to lock that bike up with. Bring warm clothing for after sunset. Be ready to get huggs and truly sincere greetings. I could go on for ever on this subject but all you need to know to be well prepared is on this board or on the website. Other Burner personal sites can be helpfull too. Have fun planning and see you on the playa. I was born right the first time too!!! Any other ideas from non virgin burners would be welcomed & very helpful. Ive never been the desert *S* I can't wait I'm so excited to go! My Best friend is going with me...we cant wait to find like minded people to share the joys of burning man! Hello and welcome. There are lots of posts about things that made peoples experiences better. You should decide how you want to do it. Some people go minimalist and bring only what they need, others decide to bring everything they own and stuff they pick up on the way. There is no wrong way to do it, unless it's wrong for you. This year my camp is bringing lots of virgins and I'll post my list of things for them that they need and that they may want. It's probably not all inclusive, but it's a good start. # Food for a week (or however long you'll be there). # 2 gallons of water per day (you'll need containers). # Goggles. The dust can be killer. # Shelter of some sort. Tents are the easiest. # Something to wear in the hot weather or nothing to wear. # Clothes for the cold weather. Prepare for freezing temperatures at night. # A bike is HIGHLY recommended. # A lock or at least something to detour someone from taking your bike. # Fun clothes for day or night. Things that allow you to jump, climb and play in that fit your style. # A water container to carry with you. Camel backs are popular, or a bottle on your bike. # A good cup that you can keep with you. Bars generally only provide the stuff to fill your cup. # Utensils and plate or bowl for when/if you're offered meals. # Sunscreen, lip balm, large brimmed hats and other hot weather tools. # Baby wipes are great on the playa. You'll use a lot of them. My Motto is everything must go! If I may interject: Ear plugs are a must unless you really--and I mean really--like techno 24/7. If sleep is an alien concept, then you'll be fine. And a bike shouldn't be considered as an extra, it is a must, assuming you want to see more of BRC than a block or two away from where ever you are camped. And if you aren't in a themecamp of one strip or another, and you find yourselves out in the hinterlands, unless you can hitchhike on an art car you will be miserable. Trust me, after eight years on the Playa, a bike should be considered indepensible. Do what you like, and like what you do. * Lip balm with velcro wrapped around it so you can stick it to your hat and reach for it constantly. * Lots of glow sticks, el wire, or blinky so you don't get mowed down by art cars. * A tiny blank booklet and pencil you can wear around your neck that fits one word per page. * Something to burn at the temple that represents what you are letting go of. I put only things that you might actually get hurt or die from if you didn't have, on my need list. You'll probably do fine without a bike, but it won't be nearly as fun. I should add earplugs to the want list. I am sorry you lost your aunt. Burning man really helped me with greiving for my mother. I am not religious (fairly anti religious) and burning man and the temple of the stars gave me an outlet that I could own in a sense. It was not a cure but it definitely helped me. Burning man has a way of connecting your self to the things that really matter in life. I did alot of thinking that first year and it was good for me. I hope you join us in the desert but I want you to do what you decide is best for you. So sorry about your aunt. 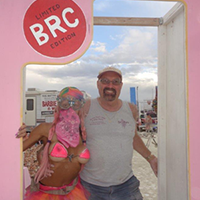 I found Burning Man as an outlet the year my oldest brother died and it helped immensely, although it took me a couple three years to hit the Temple. Bring her memory to us so we might know her too. Preparing for my 2nd trip ever to BM. First was last century. I am so looking forward to GREEN Man. I have an idea for a Dandelion Patch. I don't even know if it's feasible, but if it is I would like to find others interested in the project. Maybe at Stoney's in Reno tomorrow nite?? Or if there are any River Ranch folks doing a thang up there. Which reminds me: Anybody form Gardnerville or Carson City want to share the ride up with me?? This is going to be my first burn and I am so jacked about it I can hardly stand it. I already have my ticket and I can think of nothing else. Am I going nuts? I had heard of Burning Man a number of years ago but kinda lost track of the whole thing, not a lot of advertising (good thing I think). Anyway, I had heard about it again recently and decided to check the www. After about 20 minutes at the site I thought to myself â€¦OMG I know where I belong. I will be going alone, too far out for the wife. I donâ€™t know if I will camp alone or join a camp. I am thinking very hard about the lamplighters.